What’s that? 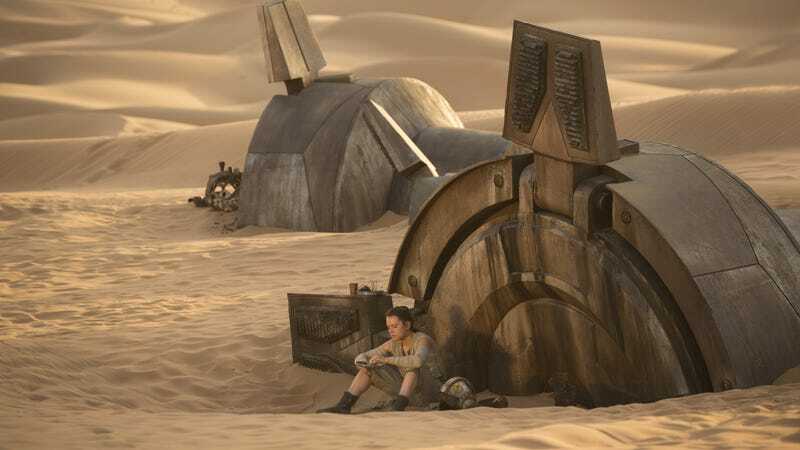 You thought the reveal in Star Wars: The Last Jedi that Rey’s parents were nobodies who died in penniless in the deserts of Jakku was the end of all the fan theories about which famous Star Wars characters were secretly her mother and father? Well you must be new here, because nothing is ever over in the world of fan theories, as evidenced by this surprisingly thorough and confident pitch from Film Threat about Rey’s parentage. According to this theory, Rey’s father is actually Han Solo, who cheated on Leia at some point after Return Of The Jedi with—dramatic pause—Qi’ra, the character played by Emilia Clarke in Solo: A Star Wars Story. The video says that this explains why Kylo Ren hates Han (he broke up the family) and why Han has such an immediate connection to Rey (he’s her dad), and there’s some stuff about a “light mother” and a “dark mother,” but we’ll let the video explain it. The video proudly declares that “this fixes everything,” but like most fan theories, it only works if you pick and choose which things from the movie to downplay and which things to add a monumental importance to. This video downplays the fact that Kylo Ren told Rey her parents were nobodies but adds a huge amount of weight to the moment in The Force Awakens when Leia ignores Chewbacca and comforts Rey after Han’s death, but accepting that reading of either scene requires you to assume that the movie is lying and introduce new information that isn’t supported anywhere else. In the scene with Kylo Ren, he even acknowledges that Rey already knows her parents weren’t famous space heroes, she simply refused to admit it to herself because doing so would mean that she doesn’t have a grand destiny to follow. That realization leads her to rejecting Kylo Ren’s plea to rule the galaxy with him and deciding for herself what her path should be (i.e., staying with the Resistance) instead of simply being a good guy because her dad was a good guy. The video also suggests that Rey and Kylo Ren being related would explain why they have a Luke/Leia-style connection in The Last Jedi, but Snoke says in the movie that he created the connection between them because he knew Rey would be unable to resist Kylo Ren’s sensitive soul and buff torso. It’s certainly possible that both Snoke and Kylo Ren were lying in The Last Jedi, but since Snoke is dead, having someone else come in and say “he was lying, Kylo Ren and Rey are connected for another reason” would be unsatisfying storytelling. Speaking of, since Han Solo is dead, there’d be no emotional payoff to Rey finding out he’s her dad, and unless Qi’ra becomes a major character in the main series, Episode IX would have to explain who she is and why she’s important in order for a reveal about her being Rey’s mom to have any weight—especially since Solo didn’t do so well and the people who only care about the numbered sequels might not have any idea who she is. The theory could be right, and the video makes a good case for it, but it seems very unlikely.